Grandmaster Wong explains some fine points regarding how to deflect an opponent's powerful kick. 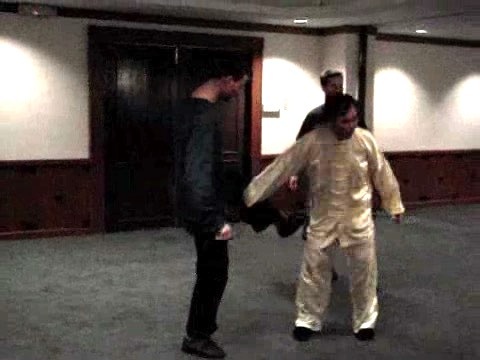 He asks Sifu Roland to demonstrate the technique slowly so that others can see it more clearly. The application of this pattern, “White Monkey Catches Pig” is quite similar to that of “Plant Willow in Front of Camp”. Sifu Roland finishes the opponent with “Monkey Opens Coconut”. Grandmaster Wong demonstrates the importance of correct hand movement. If the movement is wrong, the exponent may have his arm broken by the kick. If performed correctly, he traps the opponent's leg giving him little or no chance to escape. Notice the elegance of the pattern, “White Monkey Catches Pig”. Grandmaster Wong shows in detail how to trap an opponent's sweeping kick. It is an excellent example of using minimum force against maximum strength, which calls for great skills in timing, spacing and precision. Grandmaster Wong also reminds the participants to be careful of the opponent's hands. Grandmaster Wong shows the details of how to trap an opponent's sweeping kick. Notice that it is not a block, but a deflection according to the momentum of the attacker. In other words, when executed correctly, it does not matter even if the opponent's kick is powerful. Sifu Roland demonstrates some excellent footwork in felling and controlling an opponent. This pattern is called “Scissor Leg Technique”. Notice also how Sifu Roland covers himself giving no opportunities for the opponent to counter-strike. This is another excellent counter against an opponent's sweeping kick or knee jabs. It is called “Plant Willow in Front of Camp”. 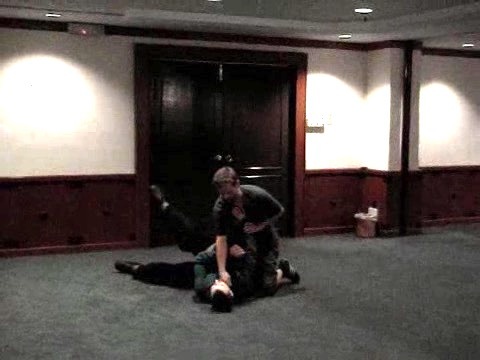 As Sifu Roland is skillful in control, the opponent's fall is gentle and graceful. It is not advisable for those without instructors to practice this technique on their own as the fall may cause serious injury to a training partner. 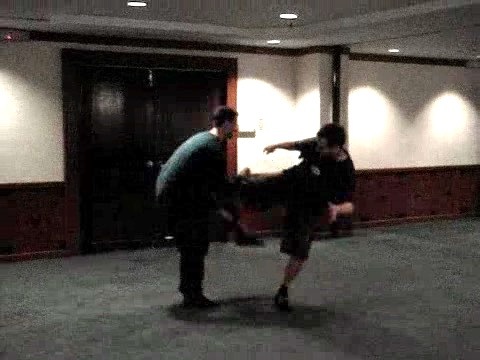 Sifu Roland demonstrates felling an opponent with his legs using the pattern “Scissor Leg Technique”. Grandmaster Wong points out that Sifu Roland could also break the opponent's leg while felling him. It is interesting to see that the opponent has difficult to escape even when Sifu Roland does not use his hands to control him. This is a deadly technique, kicking the opponent's groin as he kicks. Of course, good timing and spacing are necessary. Sifu Roland could also follow up by felling and controlling the opponent on the ground. Sifu Roland demonstrates the sophisticated techniques again, kicking the opponent's groin with “Yellow Bird Plays with Water”, and felling him onto the ground with “Felling Tree with Roots”. Even when the opponent is on the ground, you must ensure you have covered him safely to prevent sudden surprised attacks. Sophisticated Footwork and Leg Techniques of Monkeys and Gorillas from Wong Kiew Kit on Vimeo.